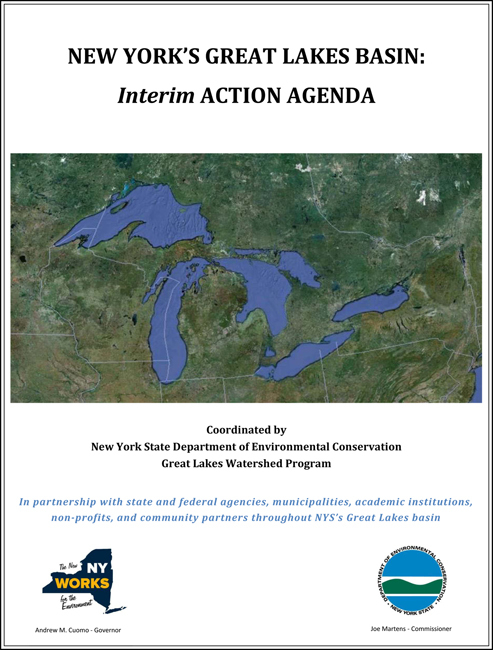 The interim Great Lakes Action Agenda is a guide to promote successful ecosystem-based management through existing programs and partnerships involving state and federal agencies, municipalities, academic institutions, non-profits, and other stakeholders in New York's Great Lakes basin. Additional information about the status of the agenda, collaboration process, and program updates are available on the Web site. In an effort to promote a more integrated response to complex ecosystem problems, the New York State Ocean and Great Lakes Ecosystem Conservation Act of 2006 directed state agencies to employ ecosystem-based management (EBM) principles in state agency programs. Ecosystem-based management is an emerging, integrated approach to natural resources management that considers the entire ecosystem, including humans, to achieve improved environmental conditions and sustained ecosystem services that support human needs and social goals. As directed by this law, an inter-agency report, “Our Waters, Our Communities, Our Future” was developed to recommend ways in which New York can further strengthen an EBM approach through existing state programs and new partnerships. One recommendation was for New York State to establish place-based action programs for our Great Lakes. This agenda achieves this vision by providing a mechanism to apply the nine principles of ecosystem-based management to future sustainable development and resource management decisions. Four sub-basin work groups for each of New York’s major Great Lakes sub-basins have been formed to work collaboratively to implement the Great Lakes Action Agenda. 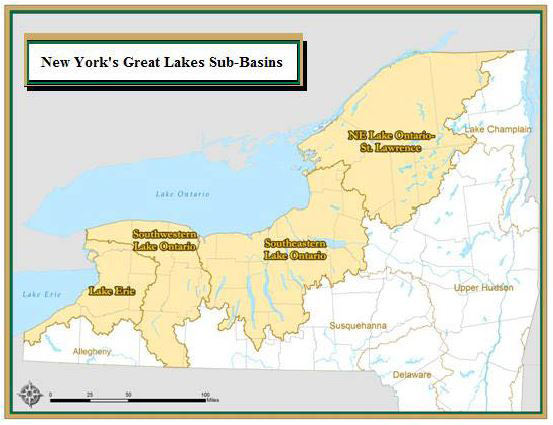 Sub basin work groups will identify and advance priority projects in each of NY’s major Great Lakes sub basins (shown below) to achieve the goals of New York’s Great Lakes Action Agenda using a place-based, ecosystem-based management approach. Work group members include environmental organizations, academic institutions, state and federal agencies, local government, interested public and other diverse stakeholders. New York’s Great Lakes Sub-Basins: Each of these sub-basins or watersheds consists of multiple sub-watersheds, defined by the relationship between their topography and hydrology. The sub-watershed scale is most practical for local planning and management. WHAT? Work groups will identify and advance priority projects to achieve the goals of NYS’s Great Lakes Action Agenda (Review Agenda at www.dec.ny.gov/lands/91881.html). WHY? Because making lasting progress within our Great Lakes basin depends on focused collaboration and collective impact among dedicated and motivated stakeholders like you! The Great Lakes Action Team is composed of state agency and other supporting partners representing broad interests across New York’s Great Lakes basin. This body serves as the steering committee for this basin-wide effort and will provide strategic direction on overall planning, coordination, and EBM implementation. Get Involved and Learn More! Subscribe to our listserv to receive the latest Great Lakes news, funding, and events for New York’s Great Lakes basin! Connect with a Great Lakes Watershed Coordinator to learn more about NY’s Great Lakes Action Agenda and get involved with collaborative efforts! Article 14 of the NY Environmental Law calls for an ecosystem based management approach in New York’s Ocean and Great Lakes basins. Report guiding how state agencies will advance an ecosystem based management approach in NY’s Ocean and Great Lakes.